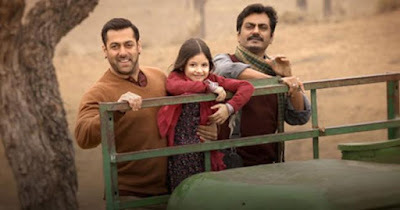 Note: I do think this film has the capacity to serve as a powerful piece of PR about Salman's real-life character among anyone who is prone to confusing (whether deliberately or not) actors with their characters. I don't know enough to speculate whether the director meant it as such, but surely the star realized the value. However, will that lesson fall on ears that aren't likely to be convinced already of his good-boy-ness? I doubt it. Uday Bhatia discusses the film's portrayal of its hero well in his review. * definition by Oxford dictionaries: "A person who appears unintelligent and unsophisticated but who has other redeeming qualities." ** Maybe more than any other performer, if I had to name a favorite performance of his, I would be very hard pressed indeed.
" mention, however brief, that dividing humankind by religion and caste is silly"
Which is why I was disappointed that the very last words of the film were "Jai Sri Ram" shouted by the previously mute Muslim Shahida, at the end of 2.5 hours in which the Hindu hero never once said so much as a single "salaam". I fully understand why it was done that way, but given the message, such capitulation was still disappointing. It didn't ruin the overall experience, just took a bit of the shine off it.